FEW girls are born beautiful. But many plain Janes are getting pretty enough to make a guy go ga-ga, thanks to the odd gimmicks beauty gadgeteers are turning out. To the male eye the strange beautifying machines look like modern versions of a medieval torture chamber. To milady the devices are the wonderful instruments that help nature transform the ugliest duckling into a lovely swan. 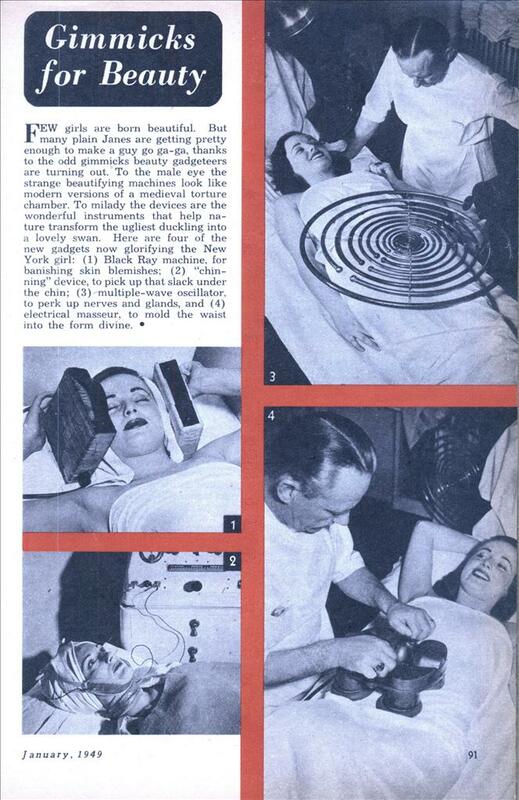 Here are four of the new gadgets now glorifying the New York girl: (1) Black Ray machine, for banishing skin blemishes; (2) “chinning” device, to pick up that slack under the chin; (3) multiple-wave oscillator, to perk up nerves and glands, and (4) electrical masseur, to mold the waist into the form divine.